Typically, an Avi GSLB service has one FQDN configured. However, there are cases where multiple FQDNS may represent the same GSLB service. Accordingly, it is possible to refer to all those FQDNs collectively, and associate them with the same set of virtual services by turning the wildcard option on. Suppose www.foo.com, www.foo.us, www.foo.biz all refer to the same global application. It is possible to configure an Avi GSLB service by specifying such a list of dissimilar domains. foo.com is delegated to Avi. t1.test.finance.foo.com, t2.test.finance.foo.com, m1.test.finance.foo.com, and so on all point to the same application - or frontend the same application. In this case, one could add a GSLB service for test.finance.foo.com, and enable the wildcard option to indicate that any FQDN machining *.test.finance.foo.com should go to the same set of applications. wildcard_match Enable wildcard match of FQDN: If an exact match is not found in the DNS table, the longest match is chosen by wildcarding the FQDN in the DNS request. Default is false. The above is supported only via the CLI. Similarly, static DNS records may be identified by wildcard as well. 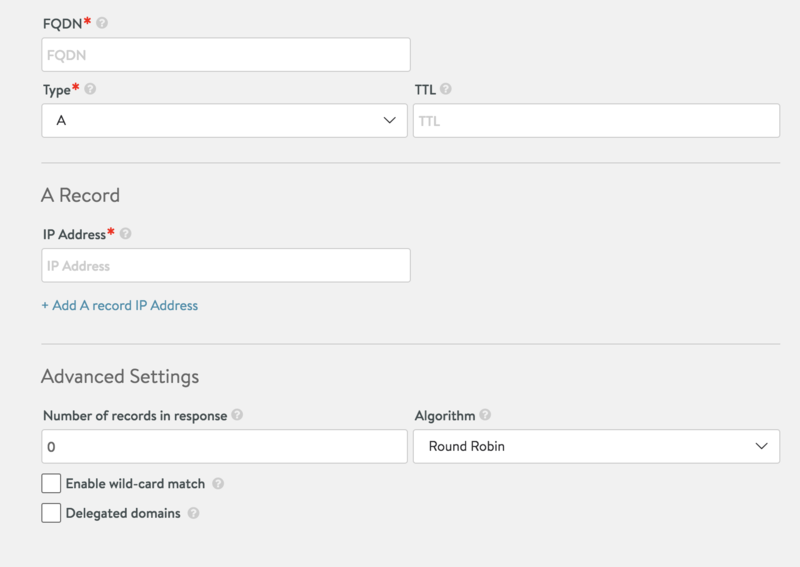 wildcard_match Enable wild-card match of FQDN: If an exact match is not found in the DNS table, the longest match is chosen by wildcarding the FQDN in the DNS request. Default is false. Static records can be configured from the Avi UI as well. Navigate to the virtual service editor (for a DNS VS) and click on the Static DNS Records.